We picked up an iPad for our social media, Web consulting and copywriting business based largely on positive feedback from many people we trust on Twitter and our own great experiences using iPhones for the past two years. It’s a remarkable device, but expensive for what you get and very limited for many usage scenarios. I’ll be blunt: The iPad is not a laptop/netbook replacement, and it’s a poor choice for anyone who really needs a full-featured Windows or Macintosh computer. The iPad is a touchscreen slate that’s limited to running approved apps from Apple’s iTunes Store and isn’t particularly good out of the box at accessing documents from your computers or file shares. And no slots or USB ports means you can’t just plug in an SD card or flash drive to access your media. Expect to purchase one or more apps to facilitate file sharing or else spend a lot of time e-mailing files to yourself! We went with the WiFi only version to save some money and because AT&T has capped its already overpriced 3G plan. Frankly, we’d rather pay hotels for the occasional WiFi key than give AT&T a monthly stipend for so-so service we’ll rarely need. You can (and should) add a Bluetooth keyboard to make the iPad passable for writing and light editing. You’ll have to reach up to tap the screen anytime you want to move the cursor, which takes a bit of getting used to and isn’t as efficient as using a mouse. It’s not a pressure-sensitive tablet, so it’s only moderately effective for sketching, and its built-in mike is adequate but it’s not going to replace my Zoom H2 for podcast recording. All that said, I rather like the iPad and it is highly effective for certain tasks. Namely gaming, e-mail and Twitter. I won’t dwell on games here since I’m focusing on its features as a work machine, but it is most definitely the best portable gaming device I’ve enjoyed to date – and as the founder of BusyGamerNews.com, I’ve tried nearly all of them over the years. The larger screen and fluid finger touch interface makes gaming even more fun than on the Nintendo DS, my previous go-to game portable. But unless your business is gaming, this won’t be enough to sell you on an iPad for the office. Overall, social media is a mixed bag. The current iteration of the Facebook app is the iPhone version pixel-doubled, and this really shows its flaws under a magnifier. Sure, it works as well as the iPhone version - but the iPad deserves better here. Honestly, you’re better off just bookmarking Facebook.com on Safari, which on the iPad is more like the desktop version of the Web browser than the puny iPhone Safari app (though you will still run into the occasional mobile app restrictions and of course Flash is still completely blocked). 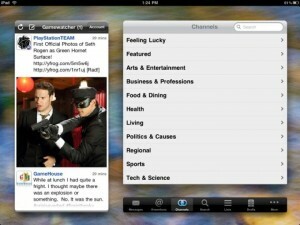 Twittelator for iPad ($5). The iPhone version of Twittelator is the gold standard for iPhone Twitter apps. It’s fast, full of useful shortcuts and – most importantly – fills in missing tweets and remembers your place if you have to quit and come back. It makes poring over hundreds of tweets reasonably efficient. The iPad version is in mostly even better than its iPhone predecessor but in a few ways takes some steps back. In landscape mode, individual tweets or streams (such as @ replies, direct messages and searches) that you select appear off to the right of your main timeline. Scrolling is fast and twitpics appear larger in the feed by default, making it easier to see whether you want a closer look. The downside is that, at this writing, it loses tweets greater than the 200 it can grab at once, doesn’t save your place if you quit, clicked links appear as an popup window instead of adjacent to your stream, and there’s no way to save images except to switch to Safari (which, again, loses your place!). But overall, getting through a couple hundred tweets is faster and more enjoyable here than with any other app I’ve tried. I’m hoping future updates address timeline bookmarking and recovery of missed tweets. TwitePad ($2). This is sort of like the free TweetDeck – with lots of optional columns you can summon – but unlike TweetDeck (and Twittelator for iPad!) it remembers your place in the timeline and has a Web browser that opens at the far right alongside them. It even lets you open multiple links and keep them waiting as thumbnails along the bottom of the browser area. Ultimately, this isn’t as elegant as Twittelator and thus hasn’t replaced it as my primary app, at least not yet. The developer is aggressive at releasing feature-rich updates, so it’s definitely one to watch. For now, this is a good choice for Twitter accounts you monitor less often, say daily or even weekly, since it can easily fill in what you miss and it saves everything for offline reading in its own local database. For that reason alone, it’s perfect for my social media consulting! Osfoora HD ($4). I bought this on impulse during a brief sale, and it has real potential. If you’re very methodical, you’ll appreciate the option to keep tweets marked as unread and there are up/down buttons to move through your timeline, though I found using this method slowed me down though may be useful for timelines that I need to focus on more closely (and finger scrolling is still an option). It does have those two very important features that Twittelator lacks: the ability to keep your place in the timeline if you quit and fill in missing tweets. EverNote. This is great for getting down drafts of articles while they’re fresh in your mind and then passing them to another device (e.g., PC, iPhone) through its cloud-based storage. No, I didn’t write this article on the iPad due to the level of editing required to make it sing. But if I did, I would have used EverNote. WordPress. I’m a big fan of Windows Live Writer, but for some reason it always messes up my WordPress posts to this blog. So I thought I’d try this free app. Still, when it came time to post this article, I didn’t have the patience to try it out. But if I had a quick post with little to no complexity, it would be perfect. iBooks and Kindle. The iPad doesn’t have the crisp display of the iPhone 4 (at least not yet), but the larger form factor makes it feel more like a solid ebook reader. I’ve avoided the Kindle and Nook because I prefer a backlit device, even if it’s not (supposedly) as good for long-term reading. I tend to read for short periods these days, and I like the flexibility to be able to switch to other apps when I want, so the iPad is now my preferred digital book platform. Overall, it’s hard to recommend the iPad unless you find that your needs greatly overlap mine, or you can’t overcome your technolust for shiny new gadgets. Consider it a nice-to-have, particularly if you do a significant amount of work on Twitter. This entry was posted on Wednesday, July 21st, 2010 at 11:23 am and is filed under Facebook, Games, iPhone, Small Business, Social Networking, Work Tools. You can follow any responses to this entry through the RSS 2.0 feed. You can leave a response, or trackback from your own site. Entries (RSS) and Comments (RSS). 24 queries. 0.442 seconds.